Salt Lake City, UT – Monnit Corporation (www. 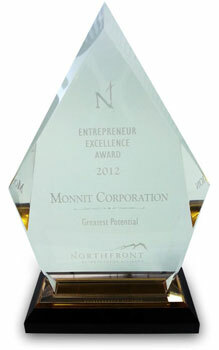 monnit.com) was recently awarded the “Greatest Potential” Entrepreneur Excellence Award for 2012, by the NorthFront Entrepreneur Alliance. The NorthFront Entrepreneur Alliance was created in 2008 with the intent to bring entrepreneurs inNorthern Utah together to learn, network, share ideas, find needed resources and to recognize achievements among the group. Since its inception the NorthFront Entrepreneur Alliance has garnered more than 1200 members. The Entrepreneur Excellence Awards are designed to draw attention to the high level of innovation and best business practices by Start-ups and entrepreneurial ventures throughout the state ofUtah. Winners of the Entrepreneur Excellence Awards are voted on by a committee of experts fromUtah’s private industry, government and academic communities. Monnit was named the Utah Company with “Greatest Potential” based upon proven business growth and customer acceptance since its initial product release 2 years ago. Monnit currently provides 35 different types of wireless sensors used to detect and monitor functions that are critical to business or personal life, including; temperature, humidity, water, light, access, movement and much more. Monnit’s wireless gateways transmit data between local sensor networks and the iMonnit™ online sensor monitoring and notification system. Click on the sensor name in the “Sensor List” window. Click the “Export” tab from the sensor data window. Click the “Export Data” button. The .csv file will be downloaded to your browsers default download directory. You can open thisfile in any spreadsheet editing program such as Microsoft® Excel. 1. MessageID: Unique identifier of the message in our database. 2. Sensor ID: If multiple sensors are exported you can distinguish which reading was from which using this number even if the names for some reason are the same. 3. Date: The date the message was transmitted from the sensor. 4. Sensor: Name you have given the sensor to Identify it. 5. Signal Strength: Strength of communication signal between the sensor and the gateway, shown as percentage value. 6. Received Signal: the signal strength measured in RSSI (From Wikipedia: In telecommunications, Received Signal Strength Indicator (RSSI) is a measurement of the power present in a received radio signal.) This is the number that is used to calculate the “Signal Strength” column which we show as a percentage. For certain engineers this column is more useful than the calculated percentage so we display both to fulfill all the needs of our users. 7. Sensor State: Binary field represented as an integer containing information about the state or the sensor when the message was transmitted. (See “Sensor State” information below). 8. Battery: Estimated life remaining of the battery. 9. Text: Data transformed and presented as it is shown in the monitoring portal. 10. Data: Raw data as it is stored from the sensor. 11. Alert: Boolean indicating if this reading triggered a notification to be sent from the system. 12. Voltage: actual voltage measured at the sensor battery used to calculate battery percentage, similar to Received Signal you can use one or the other or both if they help you. 13. Plot Value: Data presented with any transforms applied but without additional text labels. 14. GatewayID: The Identifier of the gateway that relayed the data from the sensor. 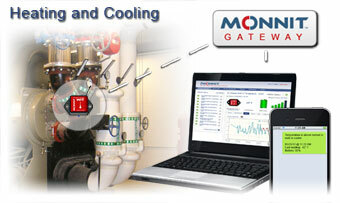 Using Monnit WIT Wireless Sensors to remotely monitor your HVAC systems, allows you to maintain efficient operation and schedule maintenance or other actions to avoid the consequences of failure, before the failure occurs. Monnit wireless sensor systems can help you monitor equipment to help you detect issues before they become serious and costly. We recommend using Monnit’s wireless temperature sensors to monitor temperatures around your building and Monnit’s affordable wireless activity timer sensors to track and monitor the operation of your HVAC equipment. Monnit Corporation (www.monnit.com) announced today that their wireless sensors have transmitted over 100 million data points for their customers. Monnit’s low cost wireless sensors, in conjunction with the iMonnit online sensor monitoring software, allow users to monitor various aspects of their business and personal environments, and receive alerts via SMS text or email when user defined conditions arise. Over the past few years, Monnit’s remote monitoring solutions have saved businesses hundreds of thousands of dollars by detecting issues before damage or spoilage occurred. “We are excited that so many businesses have adopted wireless sensing technology, and realized the value that it brings. The fact that we have collected more than 100 million data points with more than half of those being collected in the past 9 months alone, is a testament to the growth of wireless sensor technology acceptance and the evolution of the “Internet of Things.” said Brad Walters, Founder and CEO of Monnit. Monnit currently provides 35 different types of wireless sensors used to detect and monitor functions that are critical to business or personal life, including; temperature, humidity, water, light, access, movement and much more. Monnit’s wireless gateways transmit data between local sensor networks and iMonnit™ – the online sensor monitoring and notification system. OEM Offering: Key to Monnit’s business is the availability of all Monnit sensors, gateways and software as a white label offering to OEM’s. For more information, visit www.oemsensors.com.